Wit? Song? Set the Alarm! For those of you who are beginning to think that the news is getting, well, a little repetitive, there is hope. Today is April 1st, a holiday of sorts for those in entertainment. Tonight, at 7 PM on my local NPR station, the Capitol Steps will be performing. 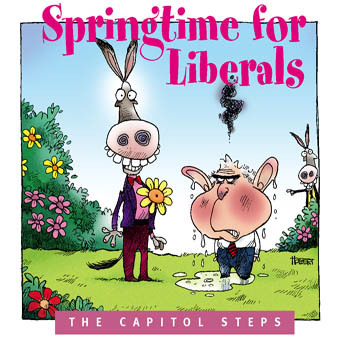 The Capitol Steps is a comedy act whose topic is, fittingly enough for a Washington D.C. troupe, politics. As they say: “we put the mock in democracy.” Both sides of the aisle are skewered with equal glee. Sure they cover the same stories that we’ve been hearing for the last seven months, but they do it in harmony. Full of puns and reworked songs, the half hour will speed by and I will wind up humming a little tune for days after. Now, if only I could remember half the quips. I see them as a kind of successor to Tom Lehrer, with a narrower focus. Or maybe they’re more like Jon Stewart’s The Daily Show set to music.